Brief Description We are a scenic train ride in the Black Hills of S.D. Description All aboard for a two hour train ride through the Black Hills of South Dakota. The 1880 Train is a tourist railroad that has been in operation since 1957. See the beautiful Black Hills through a new perspective! The 1880 Train operates steam engines on a regular basis as well as a vintage diesel locomotive less frequently. We are open 7 days a week from early May through early October. The 1880 Train is a great activity for people of all ages and interests. There is a gift shop in both Hill City and Keystone, and Hill City also has a snack bar serving food like nachos, hot dogs, soda, and sweets. 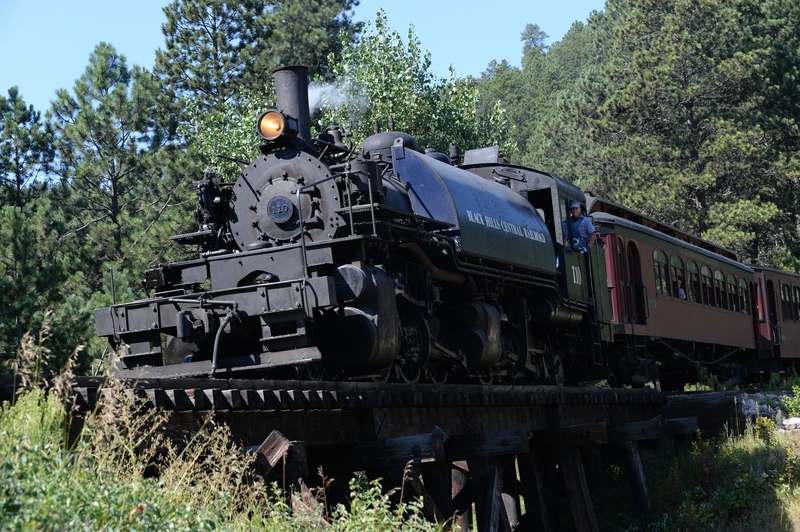 The train route used by the 1880 Train has been in place for over 100 years, and is a 10 mile stretch that runs through the central part of the Black Hills of South Dakota. Passengers can expect to see scenery like forests, meadows, and creeks, along with wildlife like deer and turkey. The train ride is narrated, and there is also a guide book available for a fee. Over 15 road crossings each way means plenty of chances to hear the unique and cherished sound of a steam whistle. Time Allowance Aproximately 2 hours. Hours Early May through early October. Add 1880 Train, Black Hills Central Railroad to your free online travel itinerary.